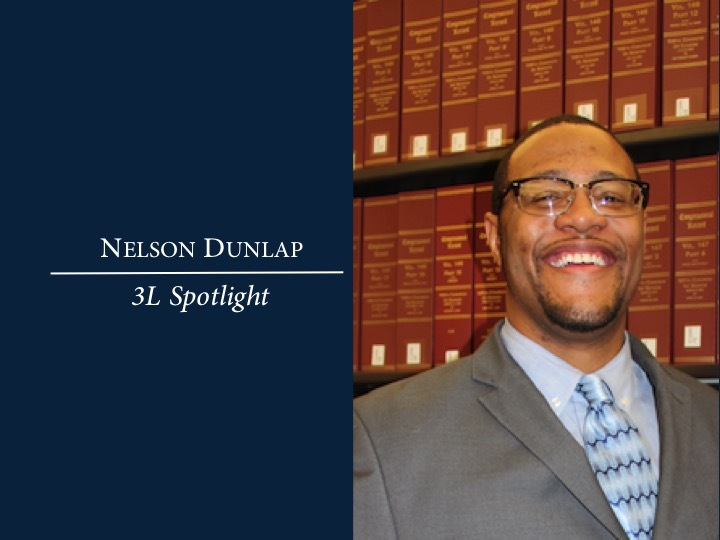 Nelson J. Dunlap graduated from DePaul University College of Law in May 2015 with a Health Law Certificate. Nelson shared with the E-Pulse his favorite moments as a DePaul law student, advice for younger students, and where he hopes his law career will take him. Nelson, a Texas native, graduated from Texas Tech University with a Bachelor of Arts in Political Science and a minor in Legal Studies. After starting at DePaul Law, Nelson realized that his legal interests rested in health law. He found the intersection between science and the law fascinating because it required health lawyers to continue their learning process well after becoming established in the profession. As Nelson put it, he enjoyed the “never ending quest for knowledge” that health law presented. At DePaul Law, Nelson was the Editor-in-Chief of the Journal of Health Care Law and a member on the Jaharis Health Law Institute (JHLI) Student Board. In both positions, Nelson worked diligently to bring success to JHLI. The JHLI Annual Symposium, this year entitled, “Designer Genes: the Cost of Genetic Information,” was the most successful symposium to date. As a student, Nelson’s favorite classes were Legal Drafting with attorney Michelle Garvey and Trial Advocacy. He found the transactional health care focused course to be the most practical and useful course he had taken at DePaul. Nelson found the assignments not only interesting and relevant, but each one had a clear real-world application. In Trial Advocacy, Nelson was able to participate in one of his favorite past times: talking. Another practical class, Nelson felt that Trial Advocacy allowed students an opportunity to gain simulated courtroom experience and to begin the process of honing their courtroom skills. He suggests that if possible, every student take these courses. Outside the classroom, Nelson gained a wide variety of health law related experiences. He worked as a health law clerk at Goldberg Law Group where he was first exposed to the practice of health law. His time there allowed him to form his own opinions on where he wanted his career to go. The following summer, Nelson worked as a summer associate at Cantillo & Bennett in Texas. The experience was different than Goldberg, providing Nelson with a greater scope of health law knowledge. Finally, Nelson worked as a law clerk at Franklin Law Group, a firm that gave Nelson the chance to work in civil litigation and administrative law. Nelson was able to participate in the trial process and gain practical trial experience that he would not otherwise have been able to experience in a private practice setting. The most exciting part of Nelson’s law school career was receiving the physical copy of his published article in the Journal of Health Care Law. Physically holding the product of his hard work and almost year long dedication was a gratifying, rewarding moment. After graduation, Nelson, like all his fellow law school graduates, will be holed up, preparing to take the Texas Bar exam. Beyond these next few months of studying, Nelson hopes to work as a litigator in a mid-sized to large firm in his home state of Texas. We at the E-Pulse want to wish Nelson good luck as he prepares for the bar, and we know amazing legal opportunities await you in the future!